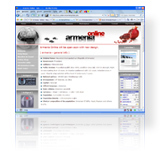 Taxation in Armenia - Individual Taxation .:.::. According to the Law on Income Tax residents of the RA and non-residents are liable to income tax. Residents are taxed on their worldwide income and non-residents are taxed on income from Armenian sources only. Individuals are considered to be resident in Armenia if they are physically present for 183 days or more in any consecutive twelve-month period commencing or ending in the tax year. Individuals whose center of vital interests is in Armenia, as well as those in the civil service of the Republic of Armenia outside the country are also considered as residents. Individuals who do not meet these conditions are non-residents. Taxable income is the positive difference between the gross income and deductions allowed under the Income Tax Law. income received from donations and assistance, etc. monetary and non-monetary gains from lotteries, etc. 3. For royalties, leasing and interest income the income tax rate is 10% without taking into account the deductions specified above. In addition to the contribution made by employers, every employee must make a contribution of 3% of wages or salaries. This amount is withheld at source by the employer and is deductible for employees to arrive at taxable income. 20,000 AMD is deducted from personal monthly gross income before calculating tax. Where a taxpayer's only income is from employment which is subject to withholding tax at source, or the gross income does not exceed 250, 000 AMD per annum, or the income is received from agricultural activity, dividends, or from an activity that is taxed in the form of fixed payments, no tax returns are required. Where there is further tax liability, a return must be completed and filed by 1st March and paid by 1st May of the following year. Income tax paid by a resident taxpayer in the RA is reduced by the amount of tax paid by them in foreign countries, with the exception of the amount of tax paid in foreign countries on income that is deductible from gross income pursuant to the legislation of the RA.